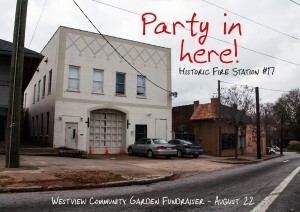 The Westview Community Organization is holding a fundraiser to help raise money to pay for the recent purchase of the Westview Community Garden on South Gordon Street. A group of generous neighbors offered the community organization a loan to purchase the land. The sale is complete, so now we need to pay back the loan! The fundraising event will feature a night of fun, including food, drinks, DJs and a silent art auction. Sponsorship opportunities are available for your business starting with a $250 donation. Please contact us for more info. Artwork, gift certificates, and more. The silent art auction will end at 11:00pm. Please have your cards/checks/cash ready. *Harvested from HABESHA’s gardens at the Dubar Center and Omenala Griot Museum. Food and drinks will be available until supply runs out.